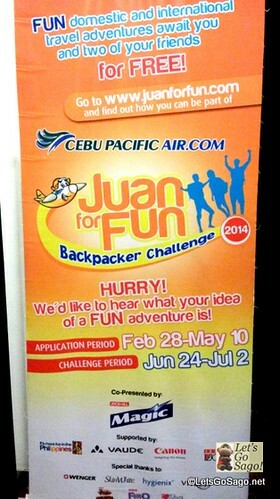 The Cebu Pacific Juan for Fun Backpacker Challenge Starts Today! | Let's Go Sago! 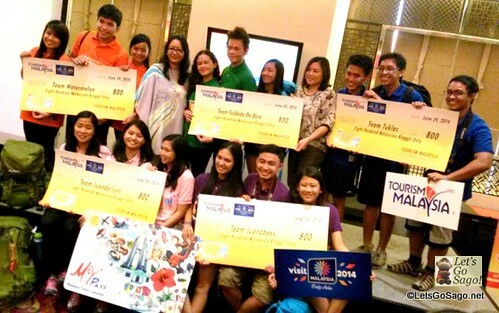 Home / Go Events / The Cebu Pacific Juan for Fun Backpacker Challenge Starts Today! The real and actual adventure starts today as the Cebu Pacific Air Juan for Fun Backpacker Challenge adventure teams were just sent off earlier over lunch from the Passion Restaurant in Resorts World Manila, right across the Ninoy Aquino International Airport Terminal 3 (NAIA 3). 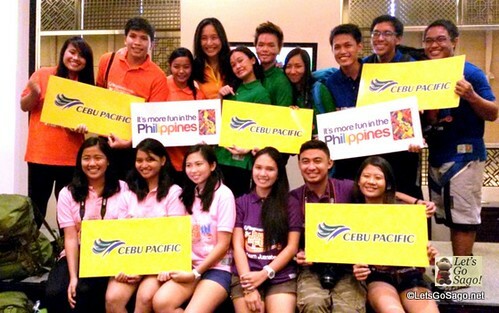 Now on its third year, Cebu Pacific Air’s Juan For Fun Backpacker Challenge 2014 sent off its top five fun-loving college student teams to seven destinations in the country and abroad including Kuala Lumpur, Manila, Legazpi, Cebu, Camiguin, Cagayan de Oro and Davao, for about nine days, all for free. From June 24 to July 2, 2014, the teams will explore the above-mentioned destinations to have as many fun activities with their MYR800 (PHP EQUIVALENT) and PHP30,000 allowance as they can. The trio with the most number of fun activities out of their given budget, and the highest standing in the Special Fun Challenges, will win the competition and score awesome prizes to go on even more exciting trips. Prizes include 12 round-trip tickets to any Cebu Pacific international or domestic destination of their choice, plus over Php150,000 worth of other exciting prizes such as Canon Powershot SX510HS cameras, Vaude Sapporo Carry-On Trolleys, Vaude Hogan Ultra-Light Tents and a lot more. In addition, teams can also win additional prizes during the special fun challenges prepared by Cebu Pacific and its campaign partners in each destination or in between. To add to the zest of their quest, Cebu Pacific has tapped five noted personalities known for their love of travel, to play the role of Adventure Coaches namely volleyball star Gretchen Ho, Internet celebrity Bogart the Explorer, sportsman and TV host Paolo Abrera, champion surfer Luke Landrigan and travel writer Jude Bacalso. Read more about them here. The Adventure Coaches / Mentors will stay in touch with their respective teams and cheer them on through social media. Team Juanabees is made up of Cams Abandula (19, UP Diliman), Kirk Coronel (19, University of San Carlos Cebu) and Gian Paglinawan (19, UP Mindanao). 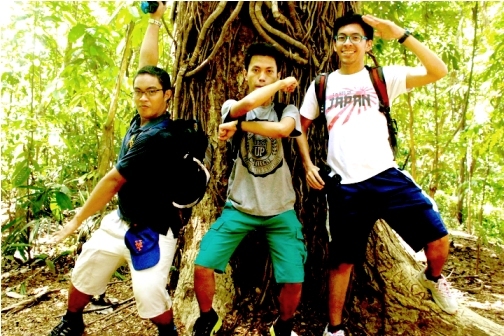 This unstoppable trio representing schools in Luzon, Visayas and Mindanao are passionate about meeting new people, discovering new wonders, and enjoying every second of life. Giving them sage advice and travel tips is volleyball star and TV host Coach Gretchen Ho. Team Juanderlust will consist of Liang Borlagdan and Mara Sy (21, Ateneo de Manila University) and Julia Negre (21, UP Diliman). They are banking on their individual strengths to win the competition and take home the big prize. Best friends since they were little, this all-girl team will be paired off with dynamic travel writer Coach Jude Bacalso. 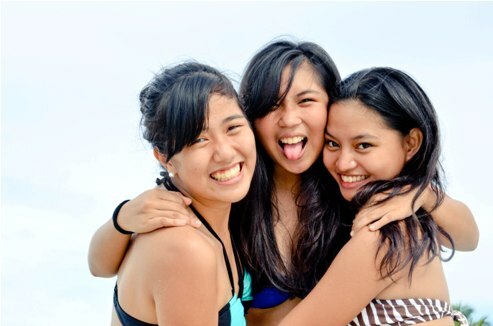 Team Juanderlust: Always up for an adventure are best friends Liang Borlagdan, Mara Sy, and Julia Negre . 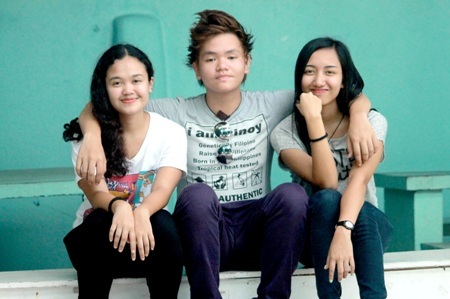 Phoebe Alba and Cyp Basa (18, UP Visayas), and Gail Dela Rosa (17, Filamer Christian University) are ready to march to adventure as Team Suldado De Dora. Their journey will surely be a barrel of laughs as they get paired off with funnyman and YouTube sensation Coach Bogart the Explorer. Team Tuklas, composed of Esme Escoto (21), Floyd Patricio (22), and Gab Saplagio (23) of UP Diliman, share a love not just for science, but for travel and adventure as well. This witty and wacky trio is all set to form their game plan with Coach Paolo Abrera. 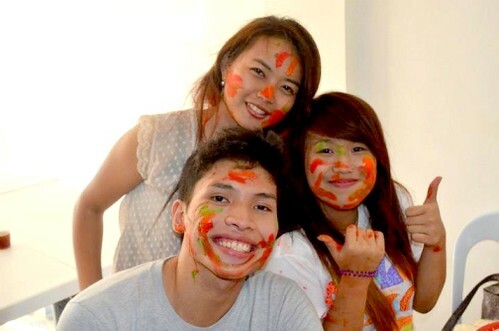 Team Tuklas: Thrill-seekers and science-lovers Esme Escoto, Floyd Patricio, and Gab Saplagio are from UP Diliman. Team Watermelon will have Paul Garcia (22), Kae Lao (20), and Jehanna Huyo-a (21) of Cebu Doctor’s University and Informatics Cebu representing the Queen City of the South. Always raring to try new things and explore their limits, this team believes that having the right mindset and being with the right people are all it takes to have a fun adventure. 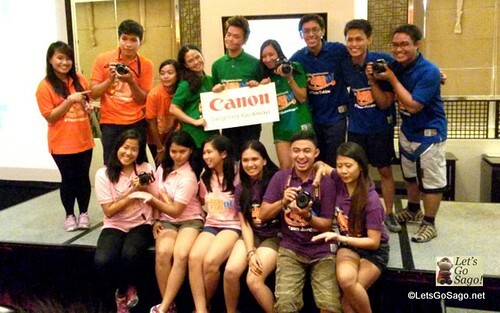 To help them make waves in the challenge, they will be mentored by Coach Luke Landrigan. Malaysia-Bound for their first stop! Join in their conversation with the adventure coaches and keep tabs with travel tips and more on Cebu Pacific’s social networking sites Facebook, Twitter, and Instagram @CebuPacificAir and use the hashtag #JuanForFun. 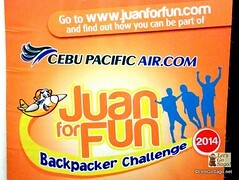 Catch the complete trial of their adventures in the Cebu Pacific Juan for Fun Backpacker Challenge at www.juanforfun.com.